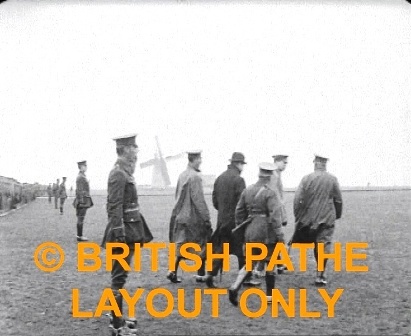 Lytham - Lord Derby, Mayor, General Sir T Perrot RFA Review - Pathe 1915. "Lytham - Lord Derby, Mayor, General Sir T Perrot RFA Review". Lord Derby inspecting RFA Brigades on Lytham Green, possibly on 16 April 1915. Officers walk along lines of soldiers standing to attention on Lytham Green with wind blowing off the sea on a blustery day. Houses to the rear of troops are on West Beach or Central Beach, Lytham. As the officials walk off we can see the sails of Lytham Windmill turning in the background. Troops march past as officer takes salute. Officers and officials confer.